Congratulations to Meredydd Evans, energy efficiency policy expert and researcher at Pacific Northwest National Laboratory, who led investigations that made important contributions to bilateral energy projects between India and the United States. Several of these projects were highlighted recently when Indian Power Minister Piyush Goyal visited Washington, D.C. and met with U.S. Secretary of Energy Ernest Moniz. As co-chairs of the U.S.-India Energy Dialog, the leaders met to celebrate successes and discuss steps to move forward their cooperation on climate-change mitigation and energy efficiency projects, improving the nations' energy security and access. Evans, along with colleagues Sha Yu, Mark Halverson and Alison Delgado, recently presented several reports [see links below] on work to help accelerate implementation of India's Energy Conservation Buildings Code at the state and local level. In both the United States and India, building energy codes not only improve energy efficiency, but also promote a market for energy-efficient products and services. The researchers' upcoming pilot program report discusses code implementation and code enforcement, and recommends a path to improve energy efficiency in public buildings. The work is sponsored in part by DOE's Office of Energy Efficiency & Renewable Energy. Evans, a researcher at PNNL's Joint Global Change Research Institute, has expertise in energy efficiency, building energy codes, and sustainable energy policies. A master of five languages, Evans travels the globe leading international teams to research complex issues and recommend solutions for sustainable energy, greenhouse gas mitigation and clean energy investments. 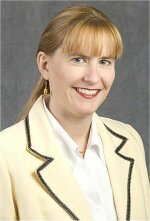 She has published numerous books, reports and articles on building energy efficiency. Evans M, M Halverson, A Delgado, and S Yu. 2014. "Building Energy Code Compliance in Developing Countries: The Potential Role of Outcomes-Based Codes in India." Report 8-283, 2014 ACEE Summer Study on Energy Efficiency in Buildings. Yu S, M Evans, and A Delgado. 2014. "Energy Code Enforcement and Compliance Evaluation: Comparative Lessons Learned from the U.S. and China, and Opportunities for India." Report 4-352, 2014 ACEE Summer Study on Energy Efficiency in Buildings. Yu S, M Evans, and A Delgado. 2014. "Building Energy Efficiency in India: Compliance Evaluation of Energy Conservation Building Code." Technical report, PNNL-23217.